Police Trap and the other Mainline titles had been distributed by Leader News. During this period there was a renew public protest about the contents of comic books. The publisher that attracted the greatest amount of negative criticism was probably EC and some newsstands refused to accept their comics. Unfortunately Leader News also distributed EC and the boycott lead to their eventual failure. Without a distributor this meant the end of Simon and Kirby’s publishing company as well. But work had already begun on the art for the unpublished issues of the Mainline comics so Joe and Jack looked for a publisher willing to take on the titles. They made a deal Charlton and after an addition two month delay Police Trap #5 finally made it to the newsstands. 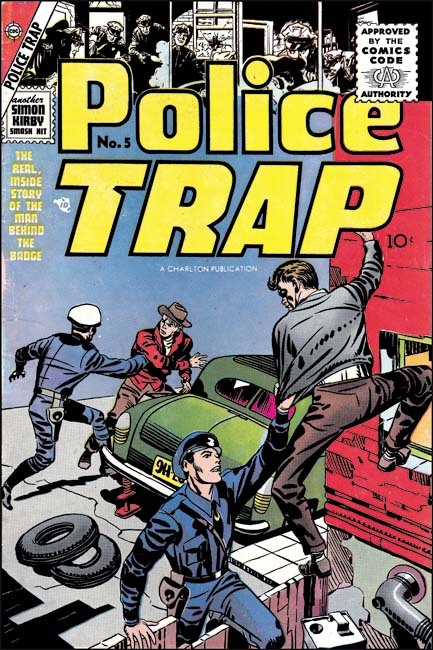 This was the first issue of Police Traps to be submitted to the new Comic Code Authority although I doubt there was much of a problem with getting approval. Compared to previous issue, the cover was not all that great. I cannot think of a Simon and Kirby cover that I would describe as poor but obviously some were better than others and this one was one of their poorest. I suspect that with the failure of Mainline and the search for a new publisher, Simon and Kirby just did not give the cover art as much attention as they previously would have. Bill Draut had drawn stories for Police Trap #1 and #3 so his presence here comes as no surprise. Draut provides “The Gun” with his usual well crafted art. However coming after his really great work on “Tough Beat” (Police Trap #3) this story can seem to be a bit of a let down. Due to financial problems arising from the collapse of Mainline, Simon and Kirby were forced to close down their studio. It seems that Joe and Jack continued to work together for a time but limited or stopped employing other artists. “The Gun” was probably work already completed before Mainline’s sudden collapse. Simon and Kirby would use some further work by Draut in the coming months but not much. Draut would work for other publishers but with the collapse of the comic book industry it must have been a difficult time for him. I am sure he eventually looked back at his time with Simon and Kirby as the golden age of his career. “The Test” was another fine piece of work by Joaquin Albistur. Albistur only worked for Simon and Kirby for a limited period of time, a little over a year. Probably Joaquin also looked for work after the closing of the Simon and Kirby studio. I have seen some original art for a smaller publisher but I am not sure when it was done. Albistur may have found some work but it does not appear he found much. At some point he returned to his native country Argentina. I am not sure who the artist was that drew “Bad Influence”. I will not claim he was one of my favorite Simon and Kirby artists but he did a good job on this story. Another unidentified artist only in this case not nearly as talented as the one who did “Bad Influence”. Note the rather awkward pose of the policeman. 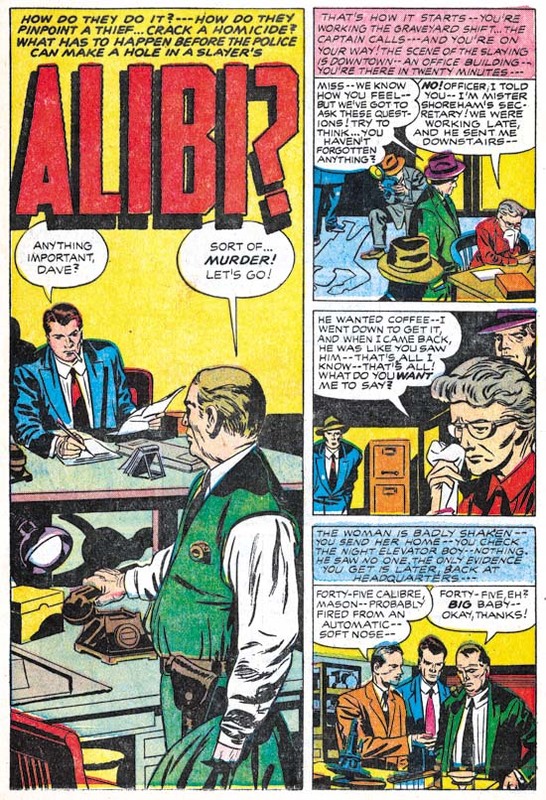 Police Trap #5 (July 1955) “Alibi?”, pencils by Jack Kirby, inks by Mort Meskin? 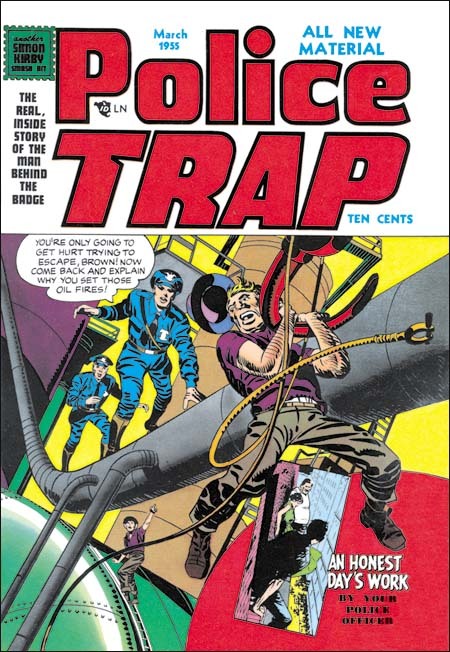 Up to now, Jack Kirby’s contribution to Police Trap was limited to the covers, one pinup (derived from an unused cover) and one splash panel. Was “Alibi” originally planned for issue #5 or was Jack filling in for working missing at the time of the collapse of Mainline? Who can say? 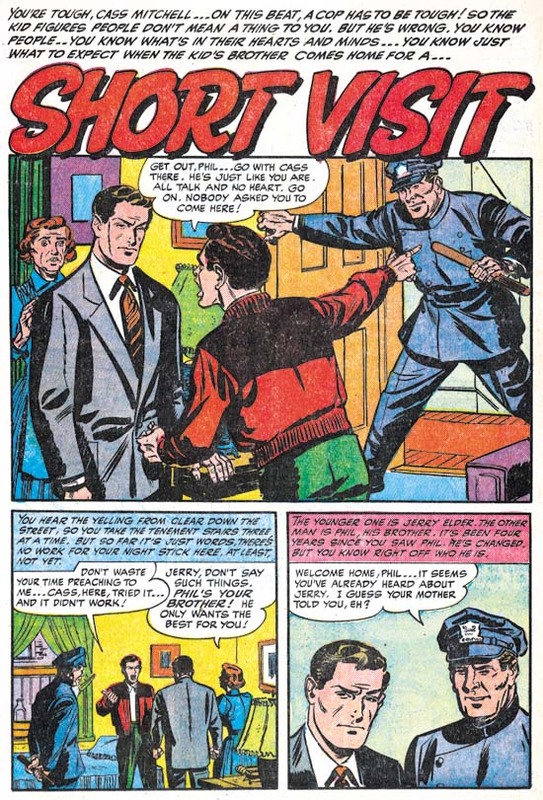 But it is nice to see a Kirby working on a crime story again since the last one he did back in 1950. The tall vertical splash was rather unusual for Kirby and a reminder that Kirby was comfortable with any panel layout. I am a little puzzled by the inking of this piece. Previously I have attributed the inking to Mort Meskin and there are parts that remind me of his work. Particularly the elderly woman in the second story panel. 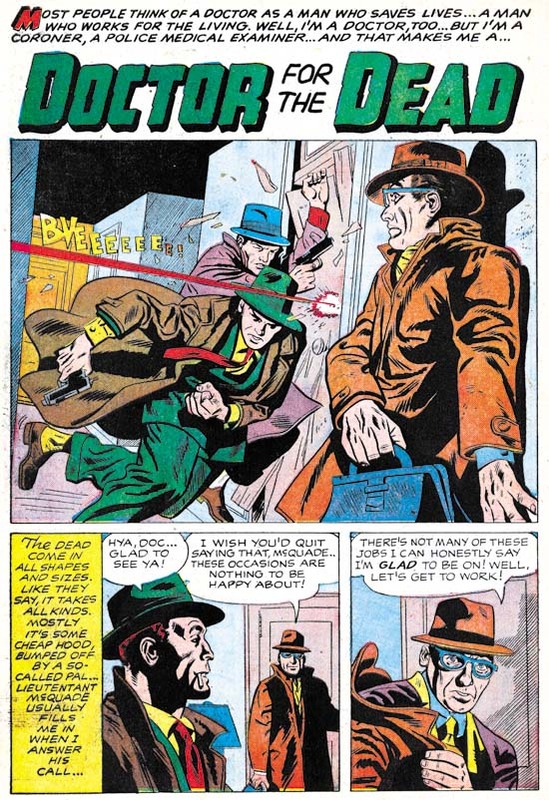 However there are other portions that do not look like Meskin’s brush for instance the sleeve of the older detective in the splash panel. During earlier periods I would explain this by the use of multiple artists sometimes used to ink Kirby’s art (describe by Joe Simon as an assembly line). With the bust up of the Simon and Kirby studio this now seems likely that only a single inker would be used (although either Simon or Kirby could be expected to do some touch up work). 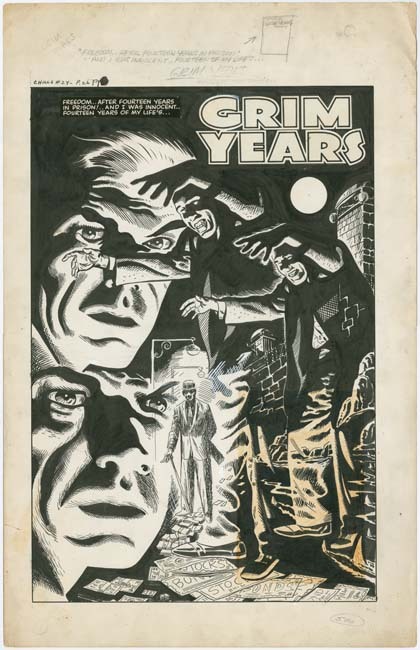 While I may hesitate to attribute the inking of this piece to Meskin, Mort was the inker for some other Kirby pencils that will be discussed when issue #6 is covered. Posted July 2, 2011 in 2011/07, 6 Mainline, Albistur, Jo, Artists, Kirby, Jack, Periods, Police Trap, z Archive. Another dramatic cover by Jack Kirby but the subject matter (setting oil fires) is not a typical crime. 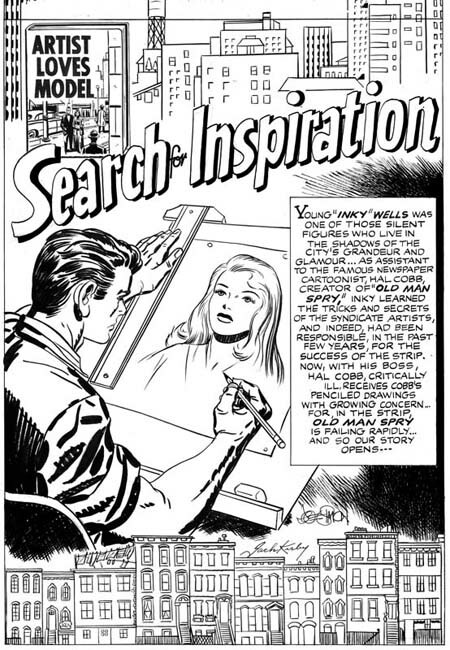 The pose of the fugitive is similar to that used on the cover of Captain America #7 (October 1941). The cover includes a little insert for a story drawn by Jo Albistur (to be discussed below). 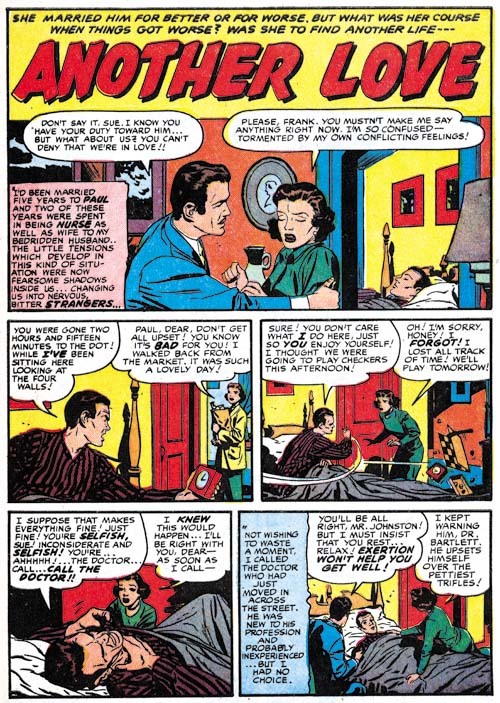 Such use of inserts is not typical of Simon and Kirby covers but was done on occassion (for instance on Young Romance #12, July 1949). 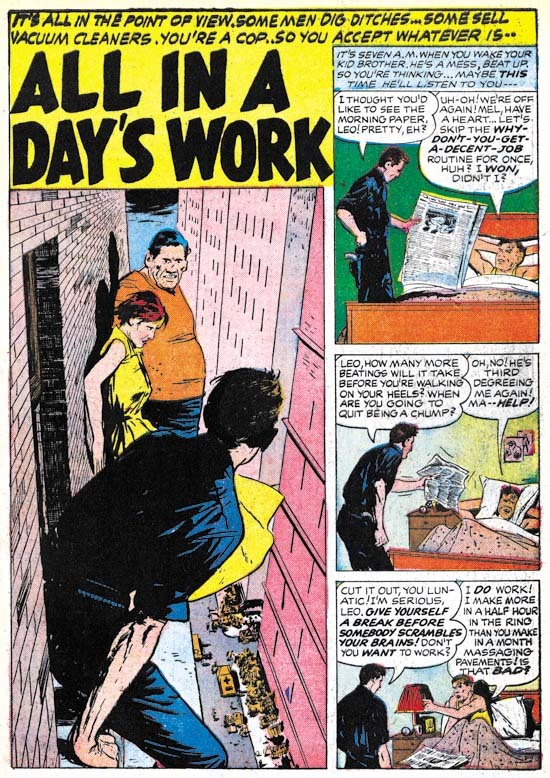 Interestingly the covers refer to the story as “An Honest Day’s Work” although in the interior the story is titled “All in a Day’s Work”. This cover and In Love #4, which came out in the same month, were the first Mainline titles to have a stamp declaring “another Simon Kirby smash hit”. Simon and Kirby were not mentioned in any of the previously released issues and they did not sign any of the art. 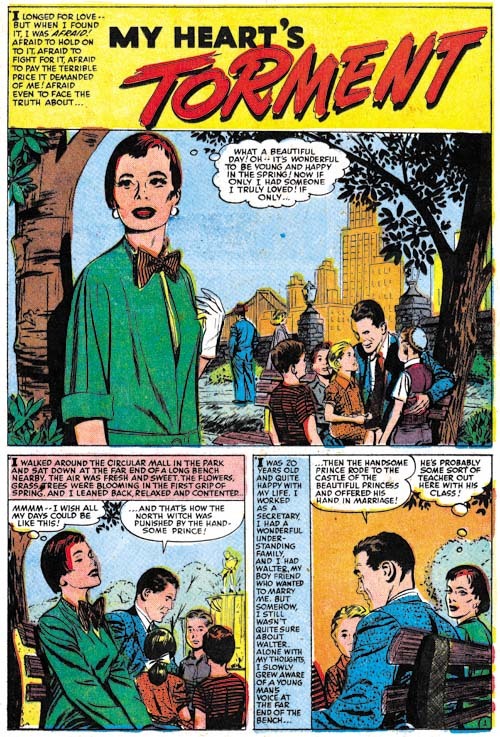 Such anonimity, quite unusual for the typcially self promotors, was probably an attempt to minimize conflicts with Prize Comics for whom Simon and Kirby continued to produce titles. However Police Trap #4 and In Love #4 included postal statements listing Joe and Jack as the editors so the gig was now up in any case. The choice of a stamp may have been suggested by the coming Comic Code whose stamp of approval would first appear on the next issue. Joanquin Albistur supplied the feature story for this issue, “All In A Day’s Work”. There are a number of features that I find attractive in Albistur’s style all of which are found in this particular story. I particularly like Jo’s careful use of body language and gesture as in the panel with the policeman shaking the newspaper and his brother’s use of the pillow to drown out his lecture. But what really makes this story unique Albistur handling of the skyscraper views. The rendering of the brickwork would normally be overdone but in this case adds much to the effect of the dissy perspectives. I may not have identified the artist for “Doctor For The Dead” but that does not mean he did not do a nice job. There are some aspects of the lettering that look unusual for a Simon and Kirby production. For instance the colored ‘M’ that starts the title caption or the scripted ‘T’ from the story caption. Perhaps this is another piece that was picked up from a failed comic book publisher. Joaquin Albistur is back as the artist for another story, “One-Armed Bandit”. The splash panel is a great example of why I like this artist so much. 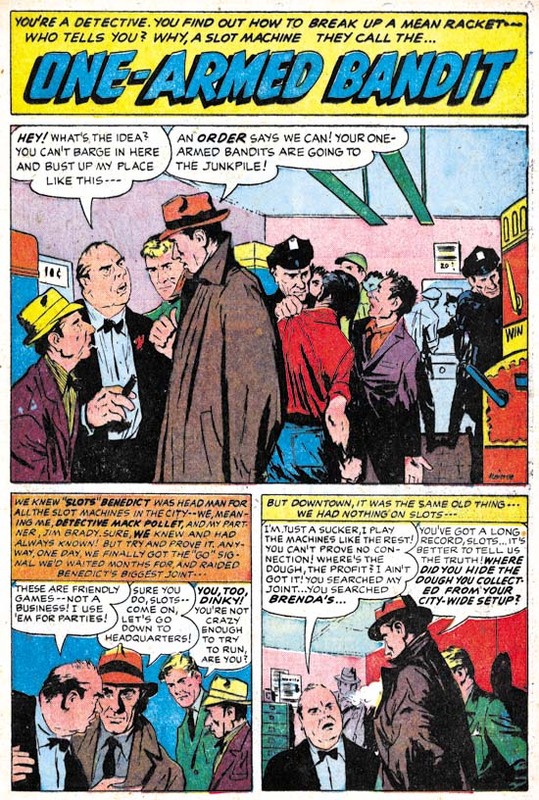 The confrontation between a detective and two hoods is all placed on the left side of the panel. You do not need to read the word balloons to determine which of the two criminals is the boss man. The background hardly deserves that term because the figures there are only slightly smaller than the foreground characters. Each person in the splash has their own distinct personality with the exception of the two cops. 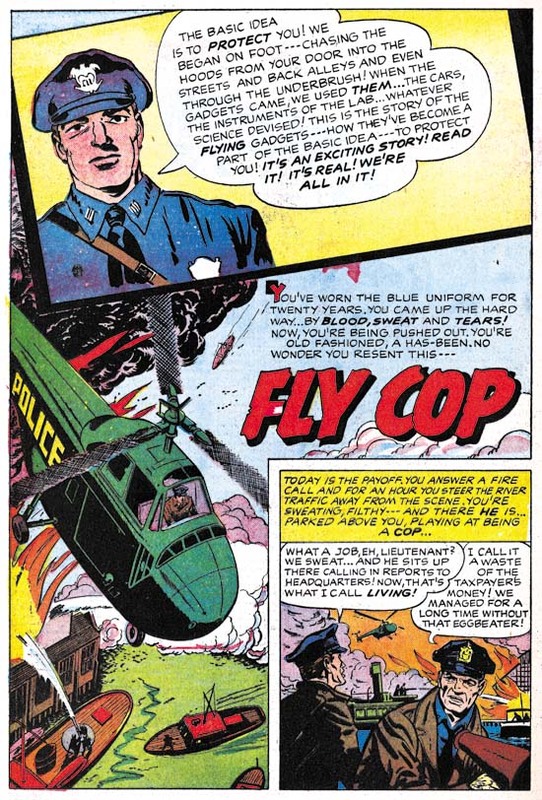 Another unidentified artist provides almost all the art for “Fly Cop”. But there in the insert at the top of the splash page is a contribution by Jack Kirby. 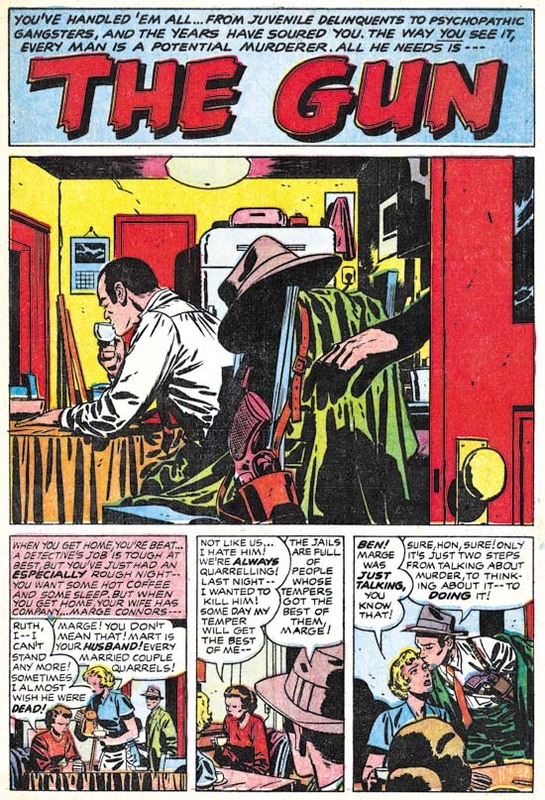 Jack often played the role as art director in the Simon and Kirby studio adding and sometime correcting the art drawn by others. Most of the time when this was done Kirby would add something to make the splash page a bit more interesting. Usually Jack would ink these additions himself suggesting that these were last minute alterations. I believe the original art for this page still exists and it would be interesting to see if it shows signs of alterations or whether Kirby’s contribution was planned from the start. Posted April 23, 2010 in 2010/04, 6 Mainline, Albistur, Jo, Art of Romance, Artists, Brewster, Ann, Draut, Bill, In Love, McCarty, Bob, Meskin, Mort, Periods, Prentice, John, Serial Posts, Starr, Leonard, z Archive. Comic book publishers were in trouble. One indication of this is the number of romance titles had reached a low point. This had happened a couple times before but previously there was a recovery, however not this time. 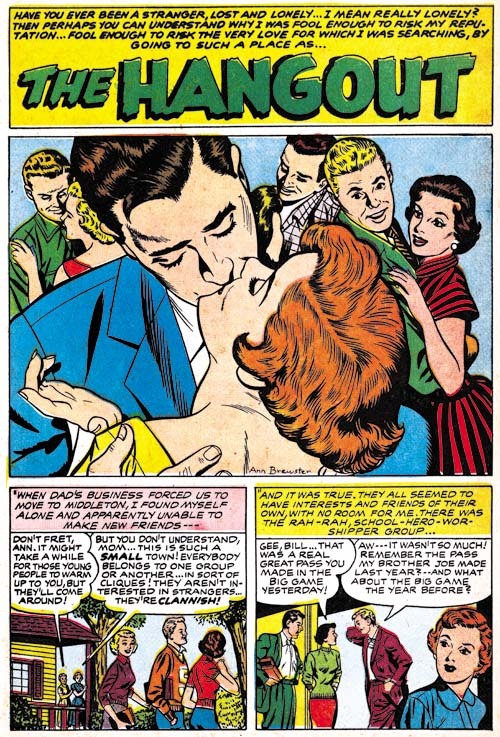 While the number of romance titles will plateau for a while the number of romance comic publishers would continue to decline (The Real Reason for the Decline of Comics). Simon and Kirby might not have noticed the trouble in the industry before but they could hardly miss it now. Young Romance and Young Love, two of the titles that Joe and Jack produced for Prize, had been monthlies for many years but with the December issues became bimonthlies. Something very odd happened with the February releases, there were none. Both Young Romance and Young Love should have come out that month but would only reappear in April (their next schedule date). 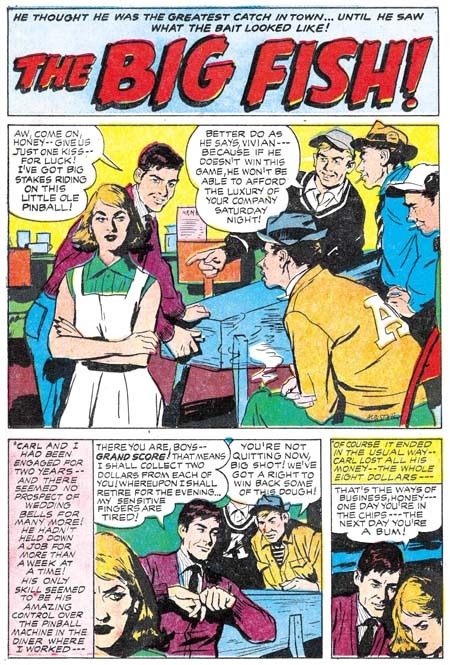 In “The Comic Book Makers” Joe remarks on some problems that developed when the owners of Prize noticed that Simon and Kirby had recycled old art. Perhaps this is the explanation for the lost February. (So far I have not identified this reused art but this is not surprising considering the thousands of pages of romance art that Simon and Kirby produced. But there was Fighting American story from this time period that was based on an old Manhunter story (Fighting American, Jumping the Shark). In his book Joe mentions a November 1954 meeting that came about due to this problem. Add a couple of months (because comic cover dates are advanced) and that would be January very near the lost February. Joe and Jack were also publishing their own comics but there were no lost months for their In Love. 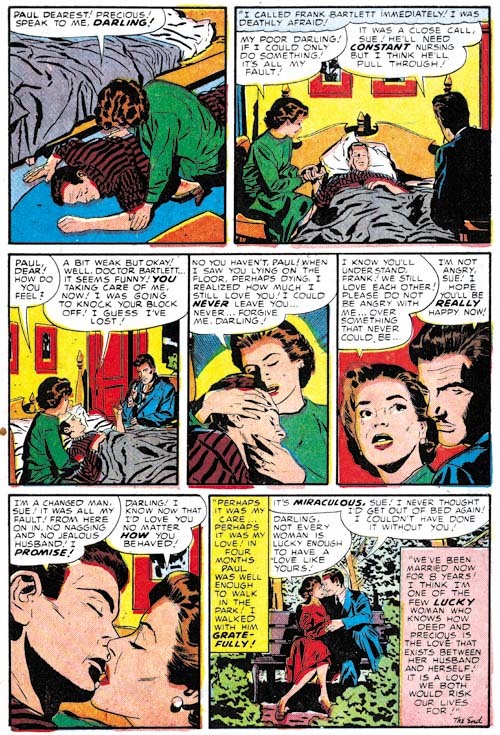 However In Love #4 (March 1955) would be the last issue Simon and Kirby would publish themselves. Their distributor, Leader News, was particularly hit by a public backlash against comics. With the failure of Leader News, Simon and Kirby would turn to Charlton to publish their titles. Charlton was notorious for their low pay scale so I suspect that whatever deal they made with Joe and Jack was not that great. In this serial post I like to provide the line up of the artists based on their productivity. During the period covered in this chapter that would be Bill Draut (61 pages), Jo Albistur (31 pages), Bob McCarty (26 pages), Ann Brewster (25 pages), Jack Kirby (19 pages), John Prentice (11 pages), Ross Andru (12 pages), Leonard Starr (4 pages), Art Gates (3 pages) and Mort Meskin (2 pages). I will comment on most of these artists below. However this list is very incomplete as there are a number of artists that I have not been able to identify. While the individual contributions of these unidentified artists were not great, combined they provided 107 pages of art. 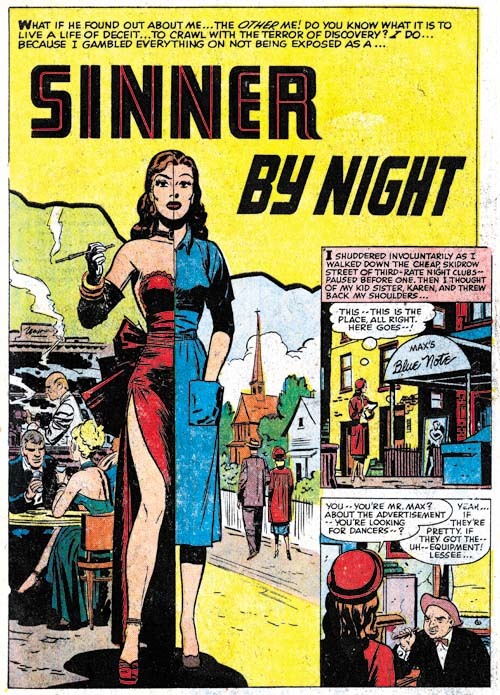 Bill Draut was not only the most productive romance artists during this period he was the most important one in other ways as well. Bill did 8 of the 9 lead stories for the Prize titles. He also provided 6 covers for Prize and 1 for In Love. All these covers appear to be created by Bill specifically for the cover and were not recycled art from a story splash as recently was often the case. 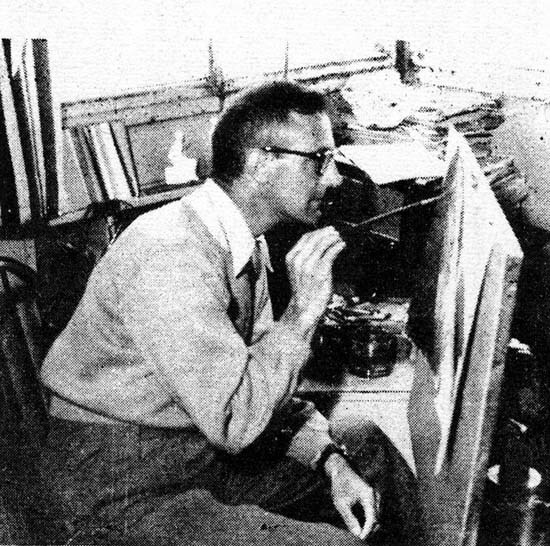 Draut was a real work horse of the Simon and Kirby studio. While not as prolific as Jack Kirby or Mort Meskin, it seems Simon and Kirby could always count on Bill to provide great art. But there is something very unusual about “Another Love”. It starts out in a typical Draut manner but the following pages look different. The characters all look like they were drawn by Draut but the way the story is graphically told does not look like his. The last page of “Another Love” provides the answer. Panels 4 to 6 do not look like Draut’s pencil at all. It would appear that this story was drawn, or at least laid out, by another artist. 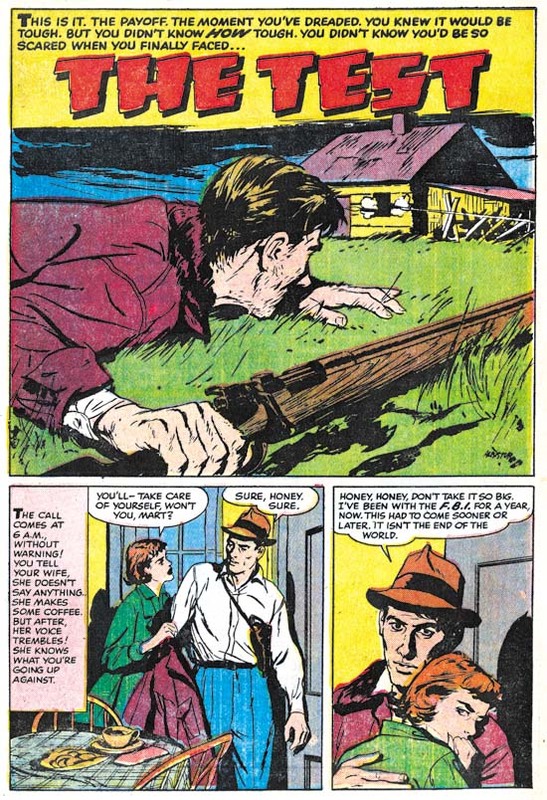 Draut’s inking through most of the story helps hide this fact but either he did not ink the last page or did so with less deviation from the original pencils. 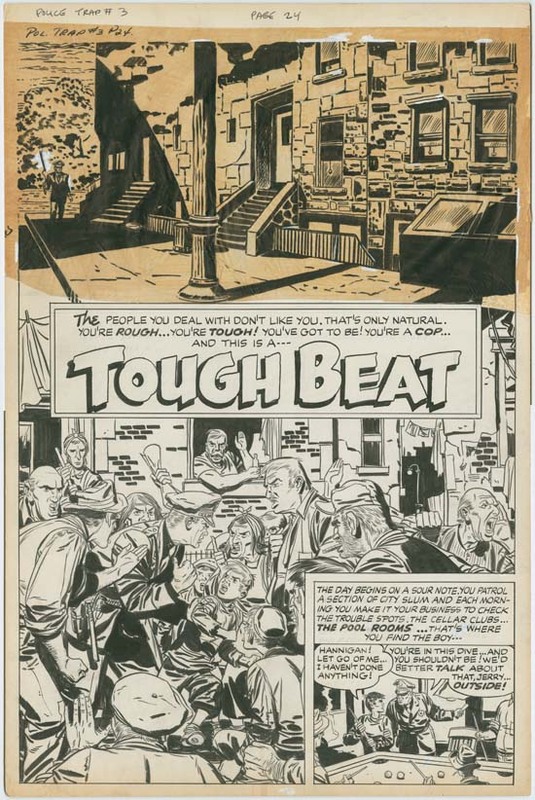 Some experts have claimed that Simon and Kirby provided Draut with layouts, at least on occasion. However I have found no evidence to support that claim. This is the first example that I have seen of Draut working on art provided by another artist, although in this case it is not Kirby. Bill Draut was not a naturally prolific artist and I suspect that his recent workload caused him to turn to another artist for help. “Another Love” is the only story from this period that this seemed to be the case; all others look like Draut’s work alone. In terms of numbers Mort Meskin’s contribution to this period was pretty meager two pages. Meskin’s period of work for Simon and Kirby is drawing to an end as he increasingly depends on working for DC. It is clear, however, that Simon and Kirby still valued Meskin’s contribution as both pages were covers. John Prentice’s contribution was rather meager during this period (11 pages and no covers). 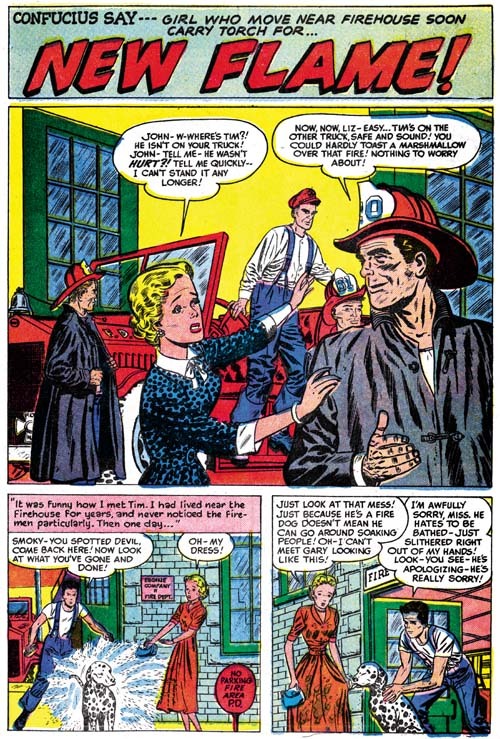 Prentice was normally an active presence in Simon and Kirby’s romance comics and his contribution during the period covered by the last chapter was significant. I have no explanation for his relative absence now. “My Heart’s Torment is a rather nice story and although it may not be obvious at a glance the splash panel is actually part of the story. This format was very commonly used by all artists about a year earlier but almost completely abandoned since. Prentice seems to be the last artist who would sometime use this technique. In the past I have often confused Bob McCarty’s work from this period with that by John Prentice. McCarty style is much easier to distinguish in both earlier and later periods but for a while his style look liked Prentice’s. I suspect that this was due to both artists being influenced by Alex Raymond’s Rip Kirby syndication strip. The easiest way to distinguish the two is that McCarty’s men have larger eyes and faces that are not quite so long. While Bob was absent from the previous period his productivity exceeds Prentice during the current one (26 pages). Jo Albistur was a recent contributor to the Simon and Kirby productions. Jo was from Argentina and would only work for Joe and Jack for about a year. He did some other comic book work but not a lot. Ger Apeldoorn has sent me scans of a cartoon that Albistur did for Humorama. I do not include it her because they are stylistically far removed from his comic book work and I prefer to keep my blog at a GP level and the Humorama pieces are decidedly rated R. While only a relatively newcomer, Albistur provided a substantial amount of art for this period (31 pages). While Albistur is not very well known he is one of my favorite romance artists. Ann Brewster was another recent but much used artists. Some years ago she had done a little work for Simon and Kirby (Art of Romance, Chapter 9). Ann is another of my favorites and Simon and Kirby were obviously impressed by her as well. 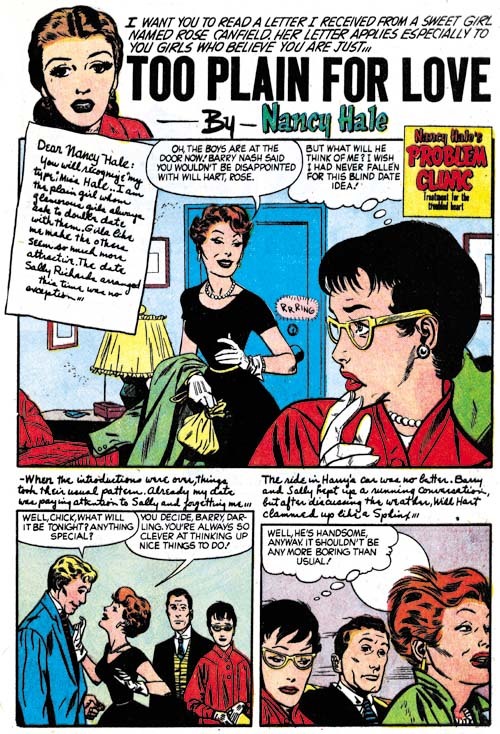 In fact she was one of the small group of artists who provided cover art for the Prize romance comics while Kirby was busy taking care of business (the other cover artists were Bill Draut, Mort Meskin, John Prentice and Bob McCarty). However Brewster’s covers art was not originally created for that purpose but rather derived from the splash from her story art. Simon and Kirby had converted splash art into covers before. It is the sort of thing Joe Simon would do in the future so I suspect he rather than Jack was behind these efforts. Art Gates has returned to providing only single page pieces and not many of them either (3 pages). But such single page works seemed to have been a specialty of Gates. Art could provide either cartoons or more realistic art but there seemed no place for his gag cartoons in the Simon and Kirby romance comics. There are two stories (12 pages) by Ross Andru during this period. As I mentioned in the last chapter, these stories by Andru were almost certainly obtained from left over work when Mikeross publishing failed (the publishing company owned by Mike Esposito and Andru Ross). “Too Plain for Love” was converted into a Nancy Hale story but it is not clear if there were any modifications beyond the title added to the top of the splash page. The story is very unusual in have the captions written in a cursive script. 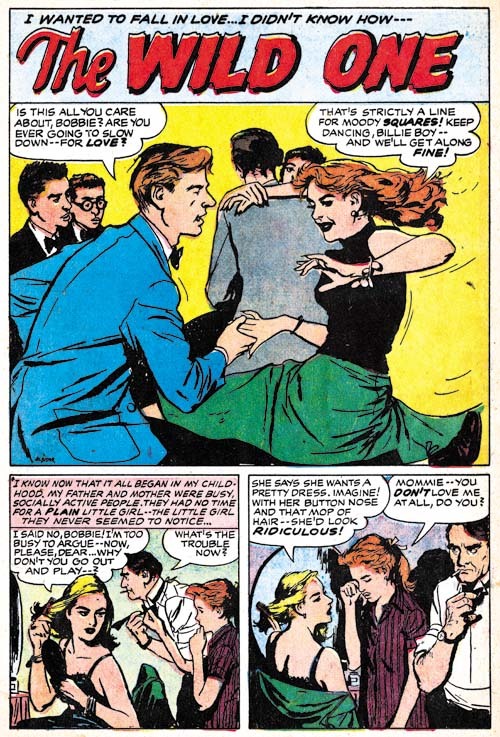 The lady in the splash in “College Romeo” also appears to be drawn by Ross Andru. The rest of the art, however, was clearly done by another, less talented, artist. I suspect this is another worked picked up from the failed Mikeross publishing. The panel layout for the splash page is the same as that used by the stories that were completely done by Andru but this is not too significant because this was a commonly used formula. As I mentioned at the start of this post, there were quite a few artists working for Simon and Kirby during this period that I have not been able to identify. I will not be discussing them all but I thought I would provide a few examples. The artist for “Personal Secretary” might have been the same one who did the previous example, “Lovely Liar”. 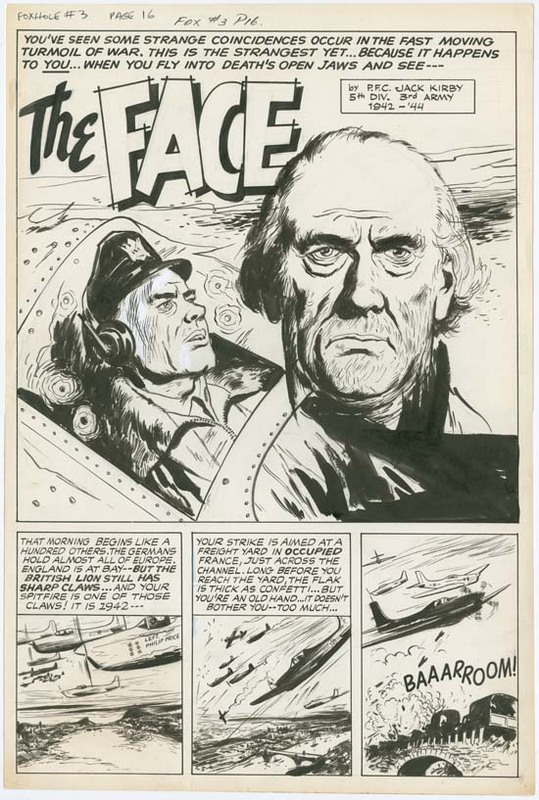 The woman in the splash panel of “Light of Love” was done in a style somewhat like that of Ross Andru. I am not, however, convinced that Andru actually worked on this piece and it maybe nothing more then the actual penciler being influenced by Andru. 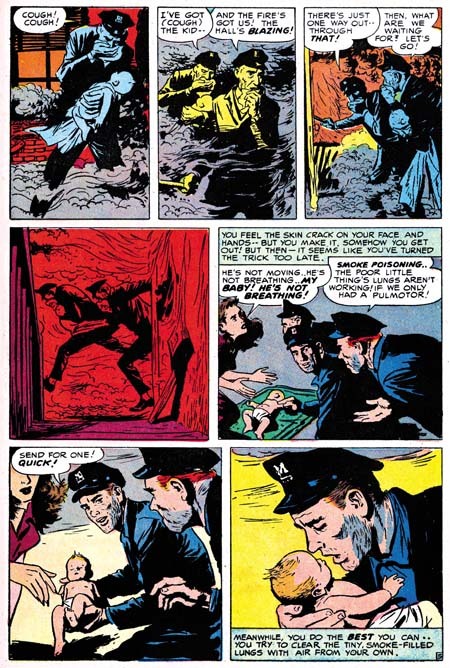 Note the panel layout common to this page and the two previous examples. 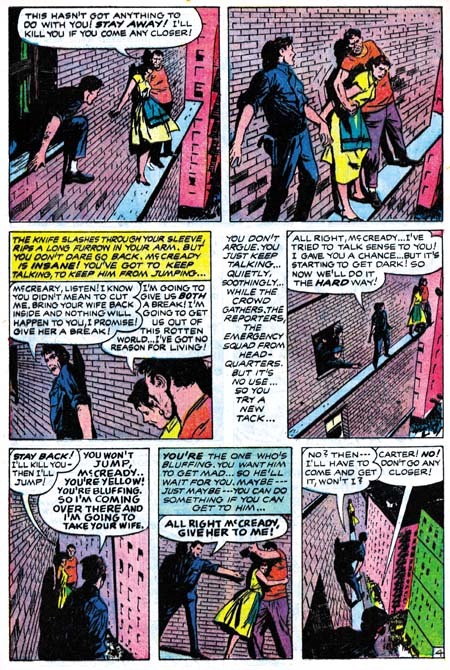 While a vertical splash panel is not that unusual in Simon and Kirby productions, that combined with tall narrow story panels is. 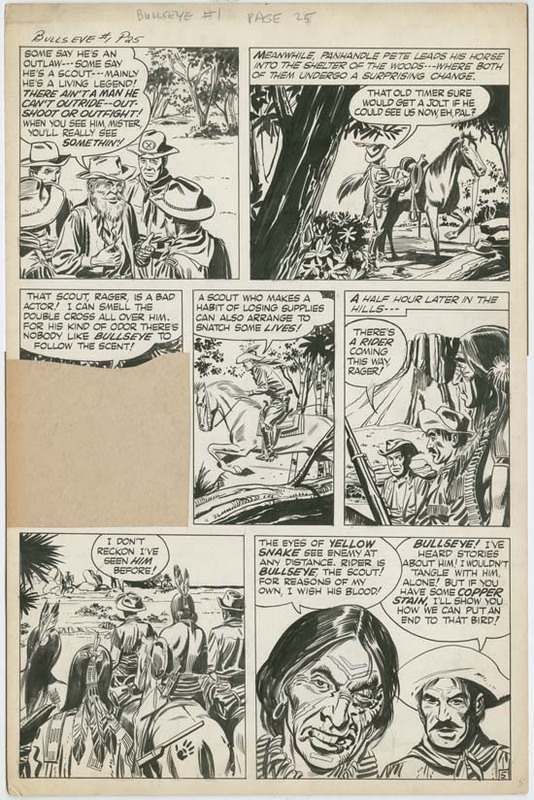 Nor is this format found in any of the stories drawn by Ross Andru. I am sure that these pieces were picked up from a failed comic book title but perhaps from a publisher other than Mikeross. Parts of “My Darkest Hour” remind me of the work of Bob Powell but not enough to convince me he actually drew the piece. I remember it has been said that he employed artists to help with his work load. Perhaps this is a case of a studio hand producing a Powell imitation. Note the rather nice touch of placing the story title in the theater marquee. Artists new to Simon and Kirby romance productions were not limited to the Prize titles but appeared in their own In Love as well. The first three issues of In Love included a very long story that left room only for a single backup story and some single page pieces. However use of a long story was dropped with In Love #4. This allowed for a greater number of artists to appear. Some of the artists such as Bill Draut, Bob McCarty and Art Gates appeared in the Prize titles as well. 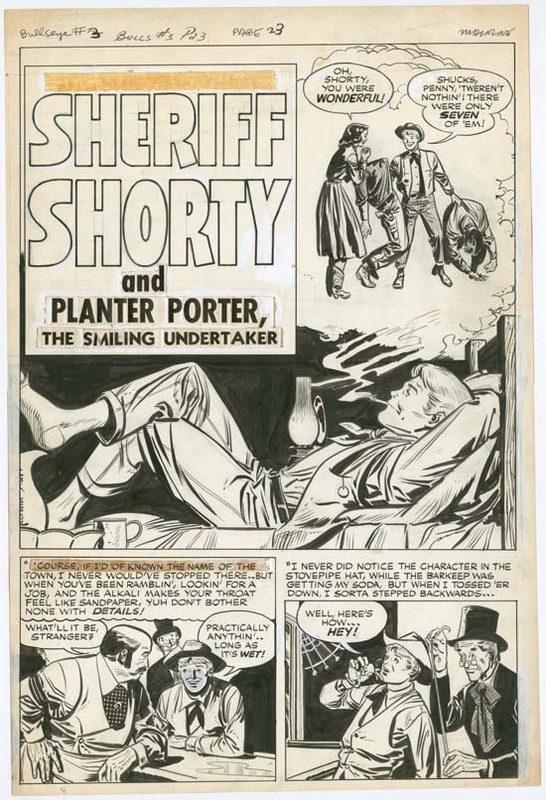 One artist, Leonard Starr, had worked for Simon and Kirby in the past but only infrequently in recent times. And yes there are artists that I have not yet identified. Each publisher tended to have his own house style. 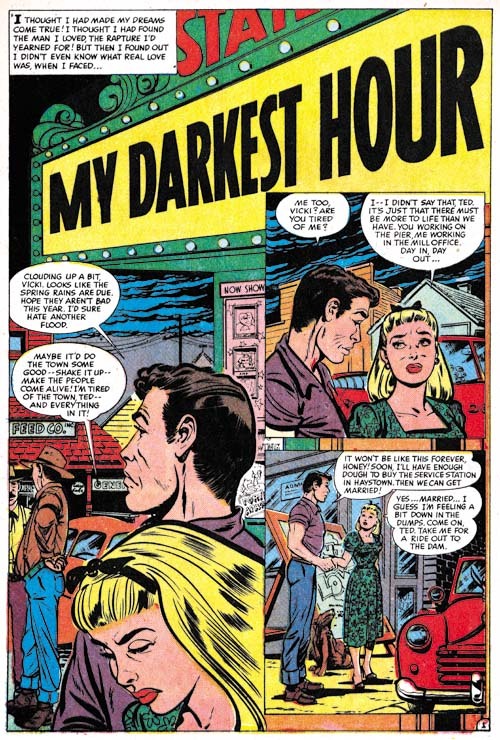 While “New Flame” is not too different from the typical Simon and Kirby story it reminds me much more of work that appeared in the Harvey romance comics. In fact the use of lower case letters in captions was typical of one of the letters employed by Harvey. 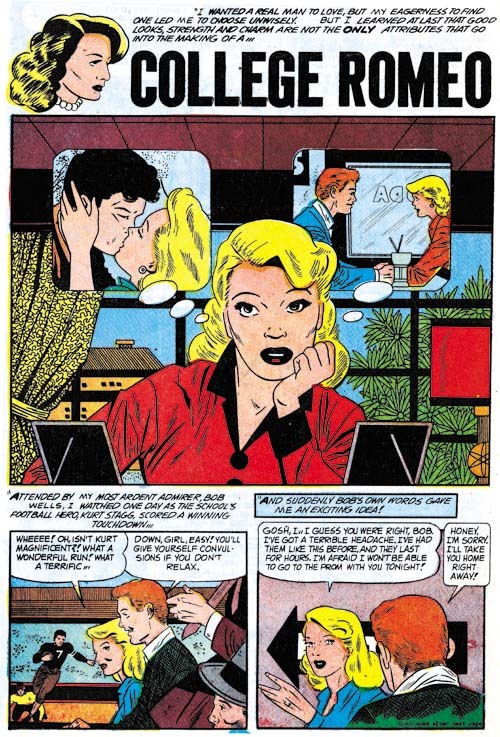 The use by Simon and Kirby of art that originally was meant for Harvey occurred previously (Art of Romance, Chapter 13) but that was during the romance glut. During the glut Harvey cancelled some romance titles and put other on hold. Therefore it seems reasonable that Harvey might have wanted to unload some of his art. But while Harvey probably suffered decreased sales during this period, I do not believe he cancelled any titles. So was this really Harvey art? And if so, how did Simon and Kirby get a hold of it? 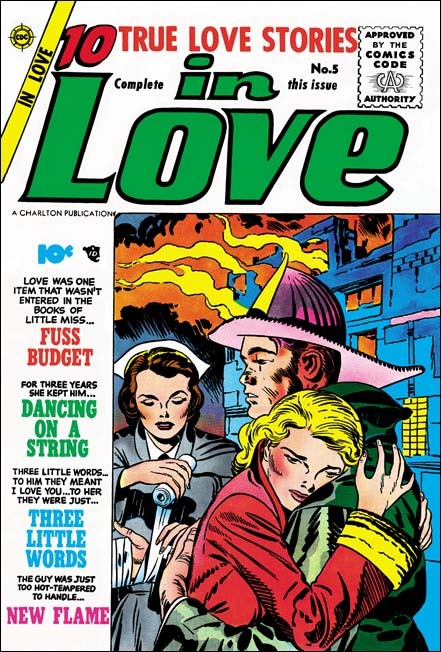 I have previously written on Jack Kirby’s contribution to In Love #3 (In Love #3 and Artist Loves Model). While Kirby’s piece for In Love #3 was a long one most of it was recycled art from a failed syndication attempt. 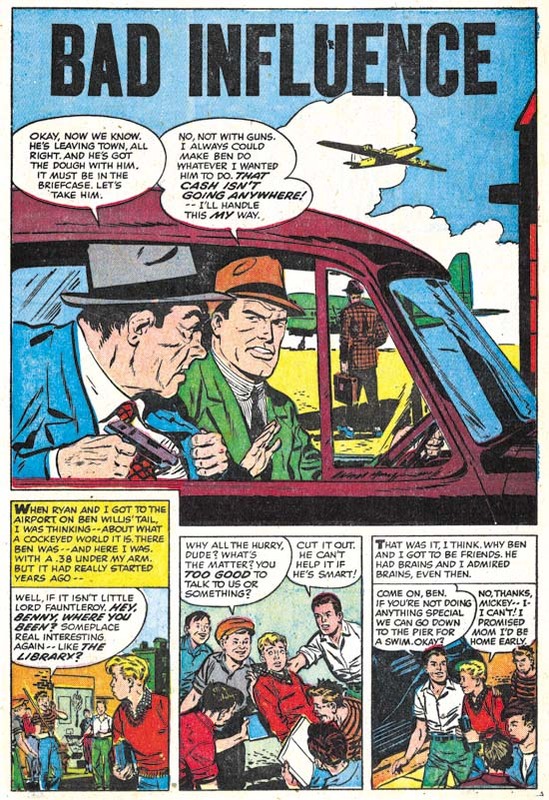 This relative absence of Kirby from even his and Joe’s Mainline comics suggests that Jack was more involved in business matters then he previously had been. As mentioned earlier, Simon and Kirby’s own publishing company, Mainline, failed due to financial difficulties that the distributor Leader News encountered during a public backlash at comic books. 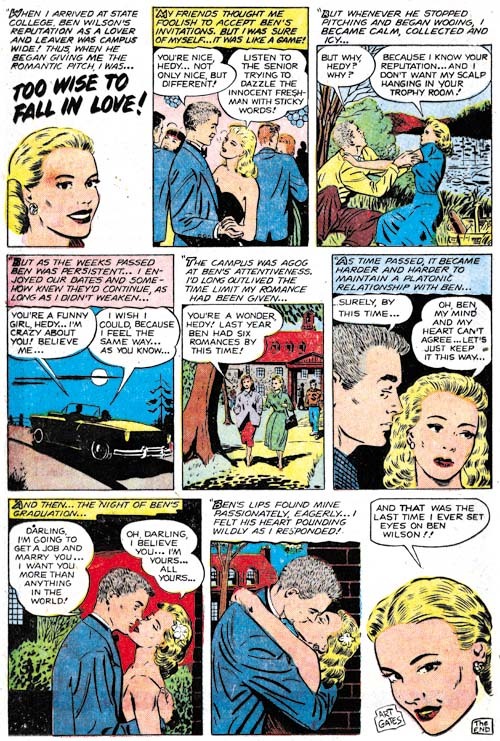 Joe and Jack made a deal with Charlton comic to publish the Mainline titles including In Love. The fifth issue was the first Charlton published one and it featured a beautiful Kirby drawn and inked cover. The original art still exists but has the title Exciting Romances. 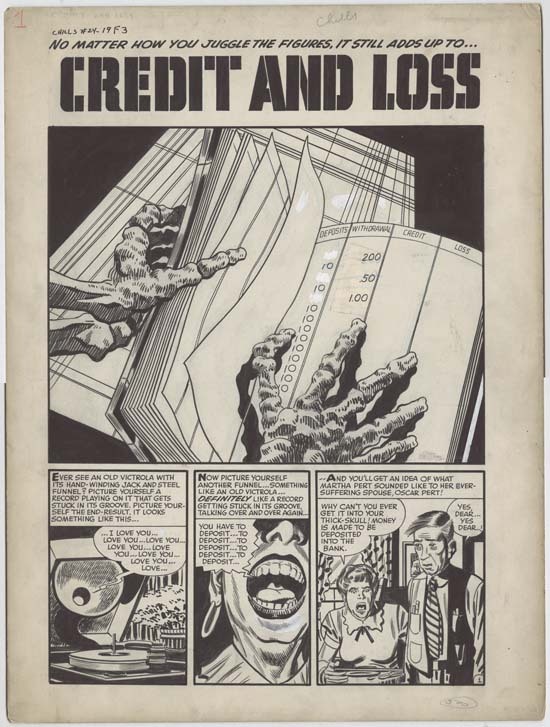 Apparently Simon and Kirby were using it as portfolio piece to show perspective publishers. If nothing else it makes a nice end to a chapter for a period with very little Kirby art. More on Joanquin Albistur or is that Joe Albistur? Posted August 4, 2006 in 2006/08, Albistur, Jo, Artists, z Archive. I hope he does not mind but Rodrigo Baeza has placed a comment on my post on the subject of Joanquin Albistur an illustrator from Argentina who may have been the same person as Joe Albistur a comic book artist that did some work for Simon and Kirby. Such help is much appreciated and I wanted to highlight it in case anyone else has some information on this subject. Harry, another Argentine artist who did work for S&K was Bruno Premiani, maybe Simon’s thinking of him. However, the following article about Argentine artists working in the U.S. comic-book industry briefly mentions (near the end) that Joaquin Albistur did some work for “Classics Ilustrated”, so it’s not unconceivable that he’s the same “Joe Albistur” that worked for S&K. I have already seen references to Joe Albistur as an artist for “Classics Illustrated”. 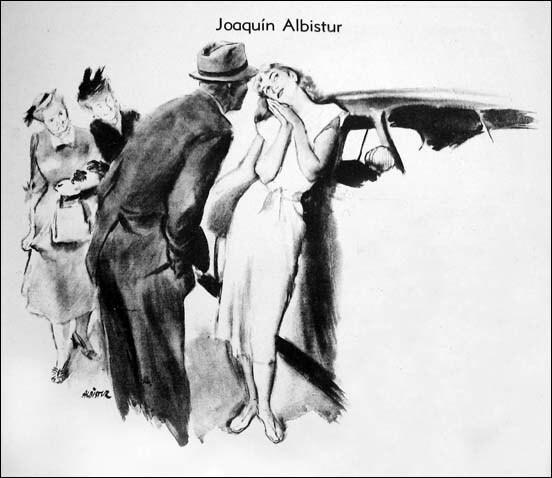 But this page attributes it to Joanquin Albistur. More evidence that they may be the same person. Joaquin Albistur the Same As Joe Albistur? Posted July 25, 2006 in 2006/07, Albistur, Jo, Artists, z Archive. 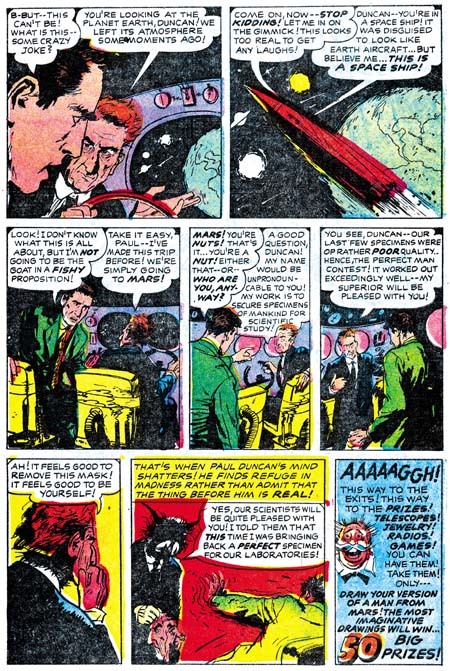 Previously I posted about the forgotten comic book artist Joe Albistur. Joe worked for S&K from September 1954 to October 1955 (cover dates). Unfortunately I really had no information on him other then the various features he worked on and further Joe Simon was unable to place his name. Well after that post I got a comment and from Toni Rodrigues suggesting that the comic book artist may have been the same as Joaquin Albistur an illustrator from Argentina. Toni was kind enough to forward to me a scan of his photograph (above) as well as some examples of Joaquin’s work. Comparing illustration art to comic book work can be misleading, they are two different media. Plus I do not know when the Joaquin art examples were created. Nonetheless I find some resemblance of Joe’s romance work with one of Joaquin’s drawings (see below). I showed Joe Simon the Joaquin photo hoping it would help his memory. Joe said the man look familiar but he could not be sure. However Joe also said that there was an artist from Argentina who did work for S&K that had a very illustrative look. That is a pretty good description of Joe Albistur’s romance work. So although it is not certain, it is likely that Joe and Joaquin are one and the same individual. Of course it would be nice to get more information about Joaquin particularly about his work in Argentina and when that was done. That could help to confirm or eliminate him as the same artist who worked for S&K. And if he is the same artist it would be nice to learn more about him since we know little about him at the present. So if anyone has more more information please let me know. Posted June 7, 2006 in 2006/06, 6 Mainline, Albistur, Jo, Artists, Assorted, Periods, Prize, z Archive. I mentioned Joe Albistur briefly in Chapter 3 of my “End of Simon and Kirby” serial post. Joe is another of those forgotten comic book artists. Web searches have provided nothing in the way of real biographical information. To make matters worse, some have misread his signature and refer to him as Al Bistur. It is easy for me to resist the temptation to look down my nose at those who got his name wrong. Honest mistakes made in the study of comic book history deserve correction not criticism. Besides I have to include myself among those who have made that particular mistake. I asked Joe Simon about Albistur. Although Simon said he felt he should remember the name, and even corrected my pronunciation, he could remember nothing about him. In a way this is not surprising. Simon worked with a lot of artists over the years and Albistur worked for the S&K studio for only a short period of time. 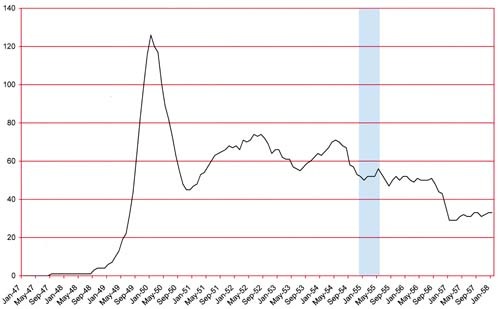 But it was that critical time during the Mainline period. Albistur first appeared in Police Trap #1 (September 1954) and last showed in Young Romance (October 1955). During his stay with S&K Joe produced 21 stories; 6 for Police Trap, 1 for Win A Prize and 14 for the Prize romance titles (see checklist). 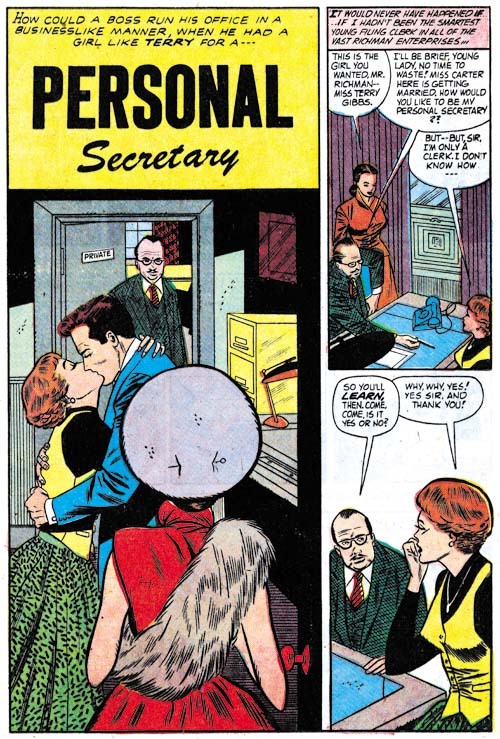 His appearance in these particular comics, but none of the other Prize titles, is one of the reasons I am convinced that Simon and Kirby were still producing the Prize romance titles at the same time they were publishing their own comics under Mainline. Joe Albistur shows up in S&K productions with a fully developed style, he must have worked in comics elsewhere before this. Joe does a good job in the mild type of crime genre that is supplied by Police Trap. Albistur illustrates the story well and seems comfortable with the action sequences. He excels in presenting a story in unusual situations; on the ledge of a building where a cop tries to talk someone out of suicide, or in burning building rescuing a baby. Kirby is said to have provided layouts for S&K freelancers, but the way Albistur does these stories I doubt it is true in his case. In Win A Prize #2 Joe’s contribution is a science fiction piece. Here again Albistur shows his story telling ability. But it also shows his weakness. When it comes to the part the alien reveals himself, Joe does not seem to know how to visualize him and so casts the face in shadow. Somewhat of a letdown. Of course it may have been difficult working for Jack Kirby, who is a master at this sort of thing. Black Magic had already been cancelled and Win A Prize never went past the second issue, so we never get a chance to see Albistur try his hand at this sort of thing again. 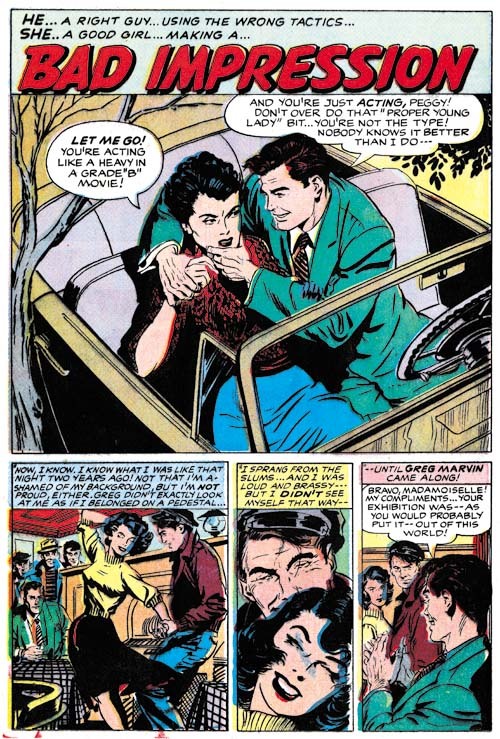 It was in the romance genre that Joe Albistur did most of his work for S&K, filling in for the absent Jack Kirby. Albistur seems an odd match for the romance comics. His women do not have the clear beauty of Bill Draut, nor the sophistication of John Prentice, nor are they stylized like Mort Meskin’s. I am lost for words on how to describe Joe’s women. The best I can do is say that they have a sort of roughness that gives them an earthy look. But we do not need to accept the quality standards of a teenage girl from the 50’s. I am not sure they would have liked Joe Albistur’s work that much, but I do. 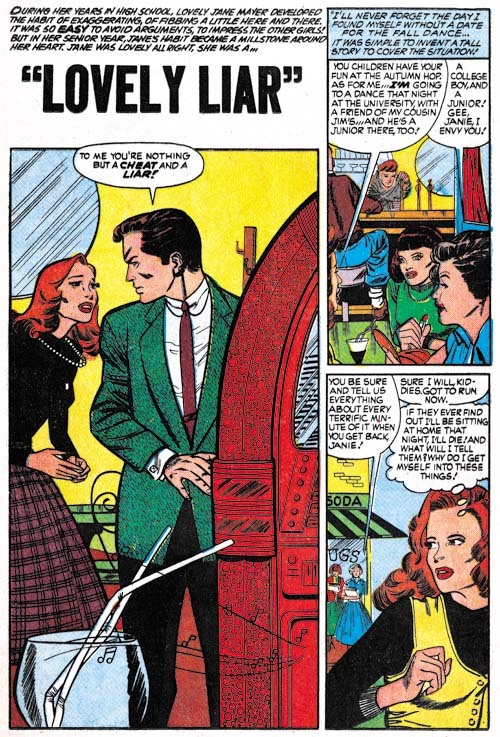 Joe used some interesting composition devices, like having a panel edge cut off much of the face of the leading woman. Albistur also had an eye for gestures, like the pin ball wizard stretching his fingers. Although Joe’s women may not have a typical comic book beauty, they are done in an easily recognized style. I have little interest in a style for style sake. But I do admire an artist who develops a unique style as a way of expressing his own personal voice. That is a quality that Joe Albistur shared with the best of the S&K artists. 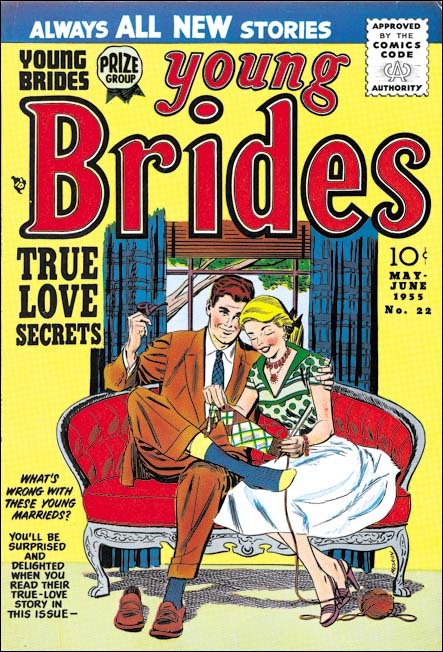 When Jack Kirby returned to providing work for the Prize romances he would begin to do pretty much the entire comic. Therefore Joe Albistur disappears from the Prize romance titles. Unlike Bill Draut and John Prentice, he does not show up in the Harvey romances. I suspect his work was not a good match for the Harvey house style of those romances. I have not seen any of Albistur’s post S&K work, but he does come up a few times in a search of the internet. It appears he did work for Gilberton in 1961 working in the Classics Illustrated and the World Around Us titles. In 1973 and 1974 Joe shows up in the DC titles Forbidden Tales of Dark Mansion and the House of Secrets. Joe Albistur was not as flashy as some of the more popular artists, you know someone like Jack Kirby. But at least in the work he did for S&K, he was not a run of the mill artist either. Albistur had talent and his own unique voice. He may not have been a superstar but he does not deserve the anonymity that he has fallen into. 1    Oct  1954    6p "Brain Wash"
3    Feb  1955    6p "The Face"
s 4    Apr  1955    6p "30 Year Man"
5    July 1955    6p "Lucky Stiff"
6    Sept 1955    6p "Decision At Dieppe"
1    Sept 1954    6p "The Beefer"
3    Jan  1955    5p "The Mountie"
4    Mar  1955    6p "All In A Day's Work"
s 4    Mar  1955    6p "One-Armed Bandit"
s 5    July 1955    5p "The Test"
2    Apr  1955    5p "The Handsome Brute"
22   (v.3, n4)  May  1955    6p "Those Two"
23   (v.3, n5)  July 1955    6p "Impossible Love"
s 24   (v.3, n6)  Sept 1955    6p "Bitter Bride"
61   (v.6, n7)  Sept 1954    6p "Just For Kicks"
64   (v.6, n10) Apr  1955    6p "Love Me, Love My Sister"
s 65   (v.6, n11) June 1955    8p "The Wild One"
s 65   (v.6, n11) June 1955    7p "Get Out Of Town"
66   (v.6, n12) Aug  1955    2p "The Proposal"
73   (v.8, n1)  Sept 1954    6p "Afraid Of Marriage"
76   (v.8, n4)  Apr  1955    6p "Lovesick Meddler"
s 77   (v.8, n5)  June 1955    6p "The Big Fish"
78   (v.8, n6)  Aug  1955    2p "Meddling Mother-In-Law"
s 78   (v.8, n6)  Aug  1955    6p "Army Nurse"
79   (v.8, n7)  Oct  1955    6p "A Torch Song For Danny"
79   (v.8, n7)  Oct  1955    5p "Castle In Spain"